From its northernmost islands to its southernmost tip, the Philippines is bursting at the seams with miles of white sand beaches, crystal clear lagoons, tropical flora and fauna, intriguing caves, enchanting rivers and many other wonders that lure visitors from all over the world. Add all these to the famous Filipino hospitality and you have the perfect formula for an ultimate getaway. Anywhere in the archipelago, you can find excellent resorts that fit different travel styles, interests and budgets. Located in one of the northernmost islands in the archipelago, Fundacion Pacita is a sanctuary that makes you feel like you’ve stepped into a different world and a different time. Its Wuthering Heights ambience would make you wonder whether you’d be bumping into Heathcliff or Catherine anytime soon. Fundacion Pacita is perched on top of a cliff with an almost 360-degree view of the mountains, the sea and the sky. Fundacion Pacita takes the Batanes experience to the next level through the enchanting views waiting in all guestroom windows and terraces. The boutique resort has at least eight suites all offering top-notch facilities, ultra-comfortable beds and viewing decks that open to stunning views of the open Batanes sky. Rates start at around $170. This resort is one of the first Santorini-themed resorts in the county. It is located in San Fernando, La Union, just minutes away from the best surfing spot in the area. Thunderbird sports a swimming pool and a nice beach with a somewhat rocky shoreline. While families come to Thunderbird to unwind and enjoy some water fun, most visitors come for the casino which has been around long before the hotel was constructed. The beach in Thunderbird is quite nice, with baby waves suitable for children to play in. The sand is not white but golden with some shells here and there. It is a bit of a walk from the hotel but it will be worth it. The resort also has a Mediterranean restaurant called Olives. Room rates start at $170 on weekend stays. 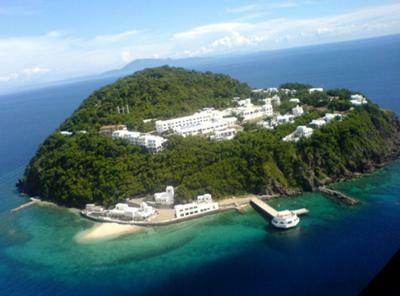 Another Santorini-inspired resort in Luzon is Bellaroca Island Resort & Spa located in a small island named Marinduque. Considered by many as a level higher than Thunderbird, Bellaroca boasts of more scenic views of the deep blue sea from its villas. Bellaroca’s charm lies in its white walls set against a backdrop of clear skies, lush greens and the blue sea. To get the most stunning views in the rock island, it is best to stay in one cliffside villas all named after Greek gods and goddesses. These villas have unobstructed views of the sea and the amazing sunset that you can watch while taking a dip in your private infinity pool or Jacuzzi. The garden villas are also a great alternative if the cliffside ones are unavailable. Villas in Bellaroca cost as much as $1,320 a night but it is definitely worth every buck. A favorite among celebrities both local and foreign, this resort in a private island offers a Philippine getaway like no other. Amanpulo occupies the entire island of Pamalican, flanked on all sides with endless blue skies and turquoise waters. The coral reef located a mere 300 meters off the powdery shore provides the avid diver a feast for the senses. Amanpulo’s claim to fame is the serenity that rubs off on anyone who sets foot on the island. Its bahay kubo-inspired casitas offer different yet equally stunning views of the sea. The island resort offers a most welcome respite for the weary soul, a place to reconnect with the sea and the sky. With the promise of exclusivity, it is arguably #1 among the best resorts in the Philippines. Amanpulo is the perfect place for a romantic getaway. Rates start at $700. Sitting on a lush hillside away from the crowded part of Boracay Island, this resort stays true to the Shangri-La legacy of sensational luxury and exceptional beauty. Shangri-La Boracay boasts of its own spa village and secluded beaches along with a number of five-star restaurants and leisure facilities. Shangri-La Boracay’s spectacular accommodations and utmost discretion is known worldwide. In fact, Hollywood super couple Angelina Jolie and Brad Pitt were rumored to have stayed in one of its villas in 2009. Guests of the resort enjoy the best that the island has to offer, from food and accommodations to relaxation and privacy. Resort shuttles can transport guests to White Beach if requested. Rates in Shangri-La Boracay start at around $320 depending on the season. Those looking to indulge in ultimate pampering can head to the exclusive Eskaya Beach Resort & Spa in the enchanting Panglao Island of Bohol. The resort lies within a 16-hectare tropical garden complete with private villas and an outstanding full-service spa. The seclusion of the resort coupled with the amazing views of the sea by the infinity pool never fails to impress even the most discriminating traveler. Aside from the private whirlpools, infinity pools and shorelines, Eskaya spoils its guests with their personal butlers that cater to their every need and whim. The island of Panglao offers many adventures for every type of traveler; it boasts of some of the best scuba diving spots in the country and the sea is a free playground for all sorts of water sports. Rates in Eskaya Beach Resort and Spa start at $500. Heading south to Davao City, Eden Nature Park & Resort offers an entirely different kind of adventure for its guests. Located in an elevated area looking out to the rest of Davao City, Eden Nature Park is a sprawling sanctuary that boasts of camping grounds, a pool, fishing areas, nature trails and private mountain villas. On top of it all, Eden Nature Park serves excellent dishes made from ingredients organically grown in their own gardens. Guests at Eden enjoy a four-kilometer nature trail that winds through the resort’s gardens, mini rainforest and open fields. Those looking for an adrenaline rush can go for a zipline ride with pine trees and gardens below. The less adventurous can just go the rope ride Indiana Jones style. Rates at Eden Nature Park and Resort are cheap (starting at $35 a night) with meals and entrance to the pool and fishing village. There are many other resorts all over the country that epitomize the hospitality that Filipinos are famous for. Aside from the warm welcome, the world-class amenities, excellent cuisine and unbeatable beauty of these resorts all add up to provide each visitor a vacation he will not soon forget. The most useful site we have found for locating and booking resorts in the Philippines is HotelsCombined.com . Hotels Combined searches over 30 of the world’s leading hotel reservation sites at the same time. Have a favorite resort in the Philippines? Share your experience by commenting below.